"I'm thinking, like, no a tree cannot do this to him," she said. "What is going on?" 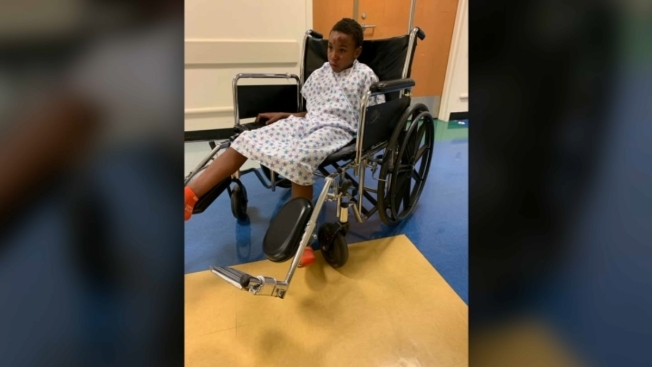 A frustrated mother is trying to get to the bottom of what happened at her son’s school last week that sent him to the hospital. NBC 5's Regina Waldroup has the details. A frustrated mother is trying to get to the bottom of what happened at her son’s school last week that sent him to the hospital. The 8-year-old student, Keon Anderson, had a concussion, cuts to his face and scratches to his arm. His mother says the injuries were a result of bullying and she’s had enough of it. "I was at work when I got the phone call," his mother Camiesha Grant said. After that frantic call, Grant says she rushed to the hospital where she found her son battered and bloody. "His head was big and his arm was messed up and blood all over his face," Grant said. She said officials at Nicholson STEM Academy told her her son got the injures after school while playing. They say he ran into a tree. But she says there’s no way a tree did that kind of damage to her son. Grant said she believes the injuries came from two brothers who have been bullying Keon since last year. "One had slammed him on the ground and one had banged his head to the tree," Grant said. "(Keon) ell out so he don't know what happened, he don't remember anything." The district also told NBC 5 it takes all allegations of bullying seriously. And that support will be available to the student after spring break and it will continue to work with the family. Keon‘s family says the plan is to keep him at the school for the remainder of the year, but he will likely attend a different school next year.